Currently working from my Milnathort home in Kinross-shire, Scotland, I have been in business since 2001 providing a friendly and personal service. I specialise in hand stitched, made to measure soft furnishings, for your home or business. Fabric, haberdashery and fittings can also be bought separately. 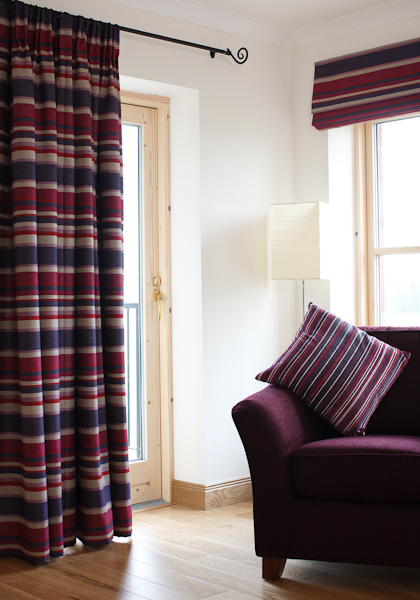 Please visit my fabric page to view the list of suppliers I can source my materials through. If you have an idea, or would like some inspiration, please give me a call. Full day classes for learning to make curtains or Roman blinds. Spaces are limited to 4 people per class, so book early to reserve your place. Gift Vouchers available. Please visit the workshops page on the left for more details.